"My pieces are an interpretation of the Dutch painter, Margareta Haverman's work “A Vase of Flowers”, on display at the Met. I decided to pay homage to Margareta after reading about her story. Margareta was an accomplished painter back in the early 1700’s. She was known for her floral paintings. Unfortunately only two known works of hers exist today. Margareta was the sole woman to learn under the great Dutch painter, Jan Van Huysum. 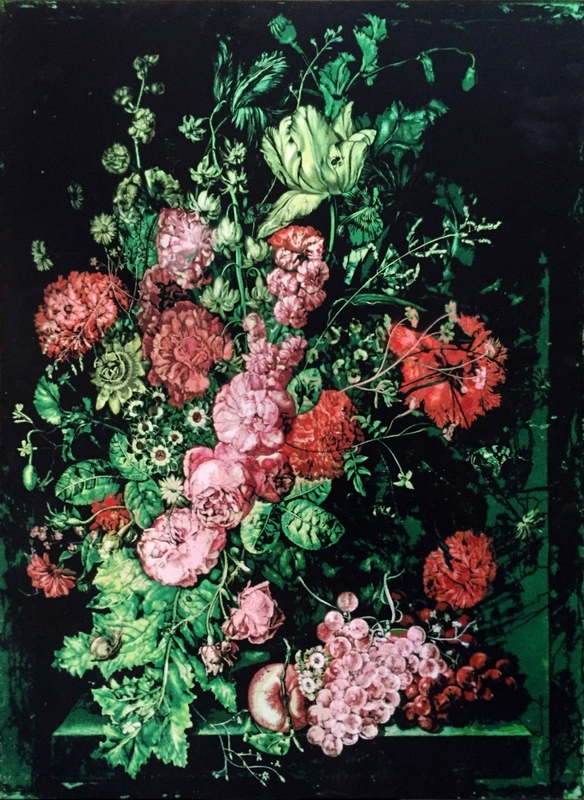 Her skills began to excel and soon her talent was equaling Van Huysum’s. She was admitted into the prestigious Academie Royale De Peinture et De Sculpture in Paris. After her admission Van Huysum became angry because he felt that her accomplishments were equalling his and that her work devalued his own. While at the Academie, Huysum approached the school and told them that the paintings that she presented for acceptance were actually his. It was a lie, but it was too late. She fell victim to the jealousy of her mentor. She was thrown out of the school. So this painting is an homage to Margreta Haverman, a hell of a painter who got railroaded by the insecurities of her mentor." You can view these works by Logan Hicks at our flagship gallery in Chelsea, New York.